Love that you’ve included how to tie these tie ~ Happy Christmas & a joyous New Year! Brilliant, funny and useful post. Many thanks and Happy Christmas to you too. 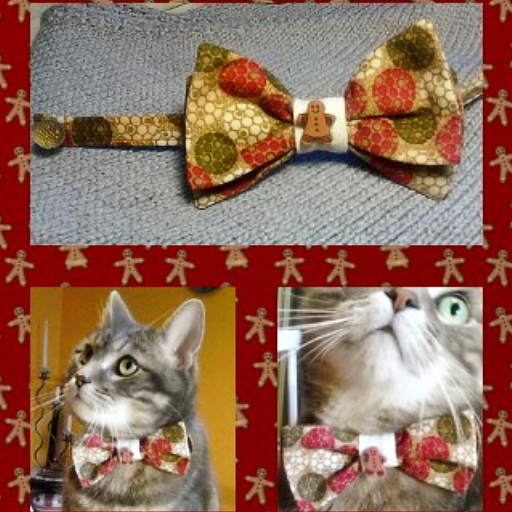 well as usual kitty has a great blog with santa & everything you could possibly want to know about bow ties. Have a great Christmas, kitty hopes that santa leaves him something special. Kitty’s pic came out SO awesome this year. 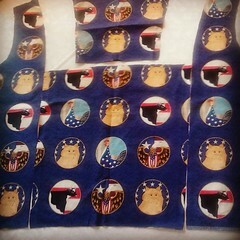 And, yes, I definitely tried to cover ALL the angles on bow-ties. Why not? What did Kitty for ask from Santa? More fabric perhaps? Best Wishes for 2015 in all your sewing adventures! I love your posts- history, education, scared old white men, Kitteh!!! 🙂 so cute! Merry Christmas! Thanks Kriston! Hope you have a terrific Christmas and eat all the things! Oh, kitty is so adorable! Merry Christmas! Kitty doesn’t have to do much to win over an audience, does he? I might add that there were also dozens of dogs at this “meet the Santa” event that he took calmly and in stride! These pictures made my day. Merry Christmas to you and Kitty from me and Orson! Aw, I’m so glad Morgan! The one with Santa looking ever so nervous makes me snort with laughter. Have a terrific Christmas and hope to see Orson next year at the next Meet the Santa event! I am surprised Kitty sat still for that, mine wouldn’t! Merry Christmas and Happy New Year to you and your’s! Thanks Linda! Hope you have a great holiday. And, Kitty is rather surprising for a cat. He swims (!) and he gets on with dogs (!). In fact, there were dozens of dogs (as well as their humans), along with lots of barking, at this Santa event and Kitty was cool as a cucumber. Oooooh, any one of these would be perfect for a ‘black tie’ event! And, you could totally funk it up by selecting a disco fabulous fabric print while leaving the rest of your outfit conservative. 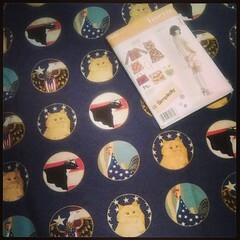 If you sew one for your cat, you KNOW, we MUST see it!! Happy Holidays Nikki! Oh kitty looks so handsome in his bow tie and definitely looks like he’s looking over his kingdom. Happy Christmas and Happy Trails to you and Grant and Zoe! I hope your travels are fun. Kitty is resting today after all his important kingdomly duties. Cute post, delightful kitty. Happy Festivus! Thanks Alyss! Hope your holidays were great and that your guests enjoyed your lovely festive gardens. Thank you. Our new year is almost upon us. You too poppykettle! I just thought of another way to use the bow-ties that you sew: use them in place of ribbon bows on gifts! Same to you, Amanda! I just saw the knit nativity scene your mum made for you! Ahh, so lovely! I’m going to show my mum who is the knitter in our family. It is an Alan Dart pattern we downloaded from his website. It’s called The Natural Nativity. Squee! Kitty is adorable in his bow-tie! 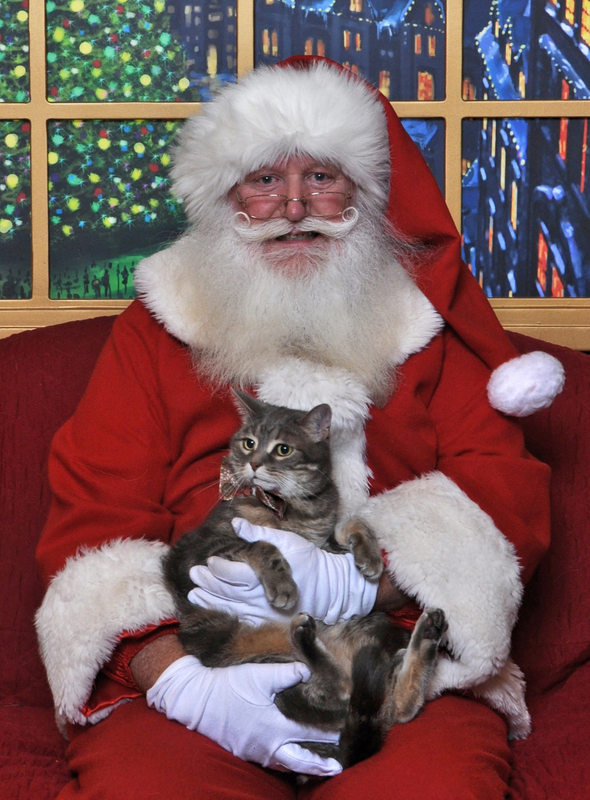 Poor Santa looks braced for an unexpected attack (I’m sure most other cats are more disagreeable about sitting on Santa’s lap!) but Kitty’s just lounging there like he’s super comfortable, hehe. I think Kitty may be the world’s most cooperative photographic cats! Merry Christmas and Happy New Year to you and Kitty! Hi Brooke, hope you had a terrific Christmas! And, I think you are correct! I assumed Santa was being controlled by Kitty’s Jedi mind-tricks, but he’s likely thinking “please don’t scratch me, please don’t scratch me, please…..” 🙂 Little does Santa know who he’s dealing with. Kitty looks so fancy in his new bowtie with Santa!! 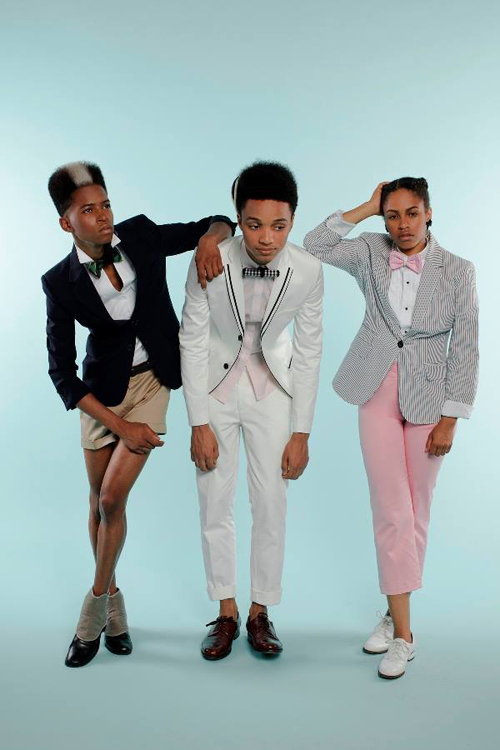 I had no idea about the back story on bowties, thank you so much for posting it all. I’ve only made a couple of bowties (for an infant to look adorable in), but I thought they were just darling and I wish more people would wear them! Kitty does rock the bow-tie, doesn’t he? He has the neck for it. 😉 Oooooh, infant bow-ties!! Something I never thought of as a gift for my nephews. That’s a good idea though. And, yes, honestly, who doesn’t look pretty snazzy in a bow-tie? It seems to be one of those accessories that can’t go too wrong. Happy New Year Kristin! Hey, Happy Valentine’s Day, Kelly!! 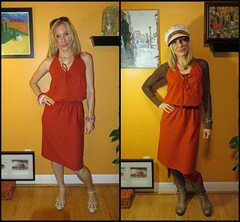 I’ve got to get around to finally posting a new post! This Christmas one is ‘dating’ my blog. Thanks Catja, Happy Valentines to you and Kitty! Have an awesome weekend! You are most welcome for the info, nothy lane! 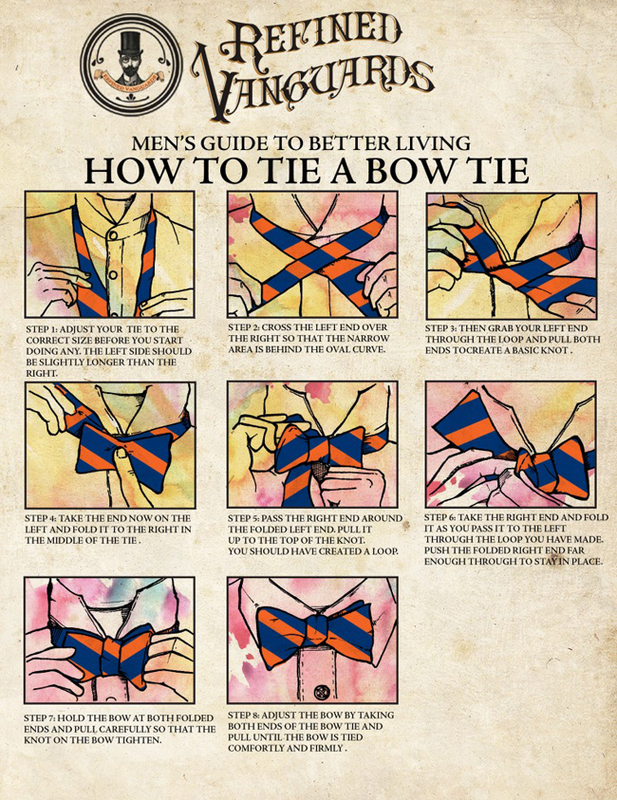 Tying a bow-tie is definitely not child’s play. 🙂 And, this is Kitty’s 3rd year to go and see Santa. He gets pretty stoked about it.